Last month we told you about LG’s mind-blowing exhibition at the ISE (Integrated Systems Europe) 2017 expo in February at the RAI Amsterdam. Read the full story and see all the ISE 2017 winners here. And then we went to DSE. 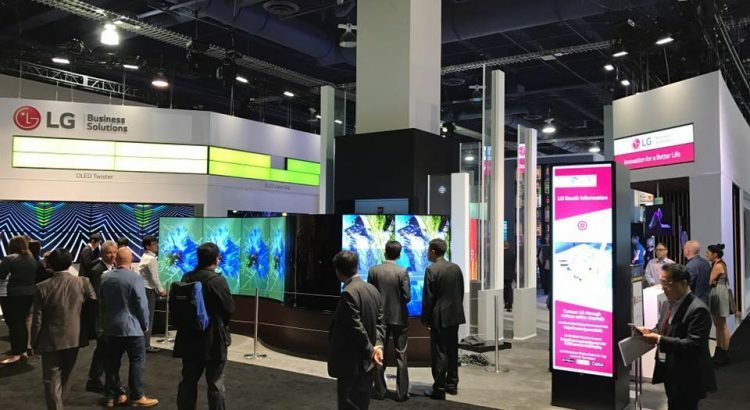 At the end of March we created a huge buzz and loads of excitement at DSE (Digital Signage Expo) 2017 in Las Vegas, where we showcased our awe-inspiring new LG OLED products and more. And once again, rAVe was there. rAVe’s full list of winning companies and products from DSE 2017 can be found here. 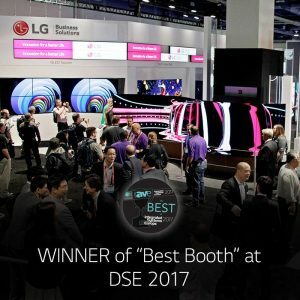 At ISE and DSE, rAVe sent reporters to every booth/stand, saw the products demonstrated or launched, and selected the top products that outperformed the others in their respective categories. these prestigious awards. And we applaud and congratulate all the winners. Razor-thin, lightweight and flexible LG OLED Wallpaper and the elegant LG OLED Wallpaper In-Glass are innovative new applications of the proprietary LG OLED technology. LG OLED is renowned for delivering awe-inspiring pictures with perfect blacks and incredible color, even from wide viewing angles, unlike any LCD/LED display can. With no elaborate mount required, LG OLED Wallpaper blends into a wall or curved structure without protruding, for a truly customizable approach. LG OLED Wallpaper In-Glass is double-sided, enabling two multimedia experiences from one wafer-thin unit. It can be suspended from a ceiling or used freestanding as a podium, saving space.